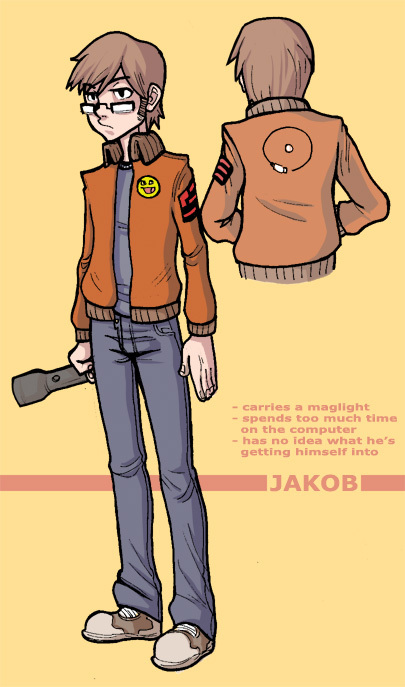 Jakob is a snide, antisocial nerd. He's lived by himself for a few years since his mother died of a rare illness, one that he's gotten through heredity. Unable to afford the cure, he's risking it all on winning the Speed Death Tourney's prize money. ROUND 1- Killed the murderous animal duo, the Barnyard Butchers, at the site of their most recent slaying. He kept Ed's kitchen knife as a chilling memento. ROUND 2- Killed the man whose nightmares come to life, David, with repeated blunt force trauma. He kept the radioactive, cursed bat that David had inherited from Sebi the Immortal. ROUND 3- Killed the homicidal Windows Vista robot, OSbot, with his cursed bat. Or did he? !